The researchers, led by Dr Farhad Islami, said the results ‘substantially strengthen’ the existing evidence between hot drinks and oesophageal cancer. Women who drink tea or coffee during pregnancy are more likely to have small babies, research suggested last November. Even women who drink less than the ‘safe’ cutoff of 200mg caffeine – about two mugs of instant coffee or three cups of tea – are more at risk of having low-birth weight or premature newborns. The researchers, from University College Dublin, said caffeine restricts blood flow to the placenta, affecting babies’ growth. The study, led by doctor Ling-Wei Chen, looked at 941 mother-child pairs born in Ireland. Tea was the mothers’ main source of caffeine (48 per cent), followed by coffee (38 percent). The results suggested that for every additional 100mg of caffeine – around half a cup of coffee – consumed daily during the first trimester, birth weight was reduced by 0.5lbs (72g). Dr Islami said: ‘To our knowledge, this is the only large-scale prospective study in the world in which actual tea drinking temperature has been measured by trained staff. That is below the World Health Organisation’s recommendation of less than 65°C (149°F). In 2016, the International Agency for Research on Cancer (IARC) – a cancer agency of the World Health Organisation – classified drinking very hot beverages above 65°C as a probable carcinogen. In China, Iran, Turkey and South America tea is traditionally drunk very hot – at about 70°C (158°F). 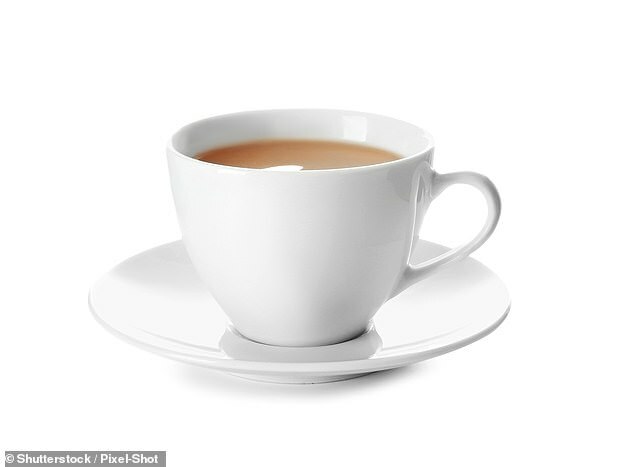 Georgina Hill, health information officer at Cancer Research UK, said: ‘This study adds to the evidence that having drinks hotter than 60°C may increase the risk of oesophageal cancer, but most people in the UK don’t drink their tea at such high temperatures. Previous research has suggested waiting at least four minutes before drinking a cup of freshly boiled tea, or more generally allowing foods and beverages to cool from ‘scalding’ to ‘tolerable’ before swallowing.